As I announced earlier, MAC and Dita Von Teese collaborated for a second time: first Dita being the Viva Glam spokesperson in 2006 and 2007 and now giving her the chance to create her own MAC lipstick, which is called Von Tease. Luckily, I managed to get my hands on this highly coveted - but unfortunately sold out - lipstick and decided to review it for you. I'm not sure when I became a fan of Dita, but I think it must have been around the time that she married Marilyn Manson, of whom I was a big fan starting from my early teen years. It was her that made me comfortable of and in my pale skin and it was also her that shaped my love for pitch black eyeliner and red lipstick. Dita never misses a beat and always looks impeccable, you can Google it if you don't believe me. Oh, and she always does her own make up! 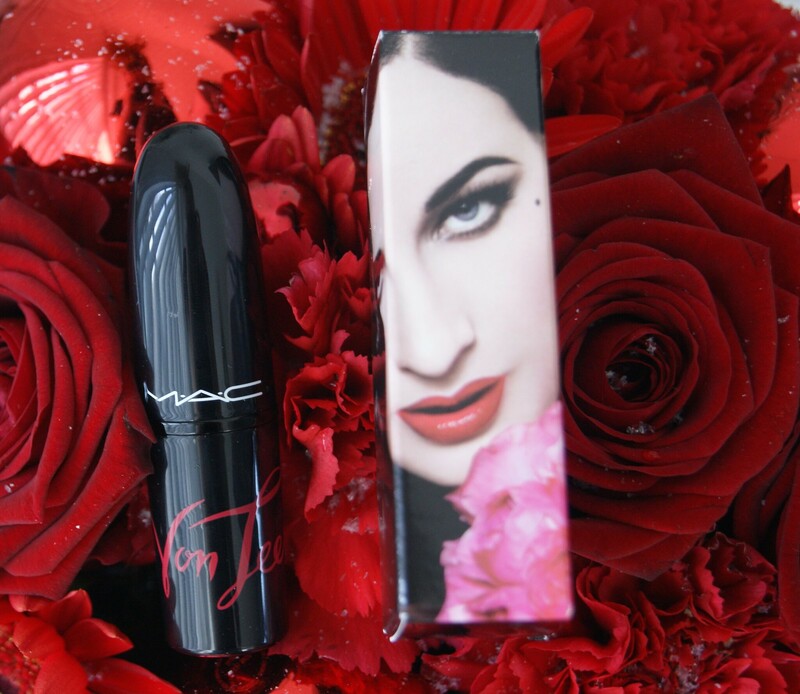 Von Tease comes in a glossy black tube with 'Von Teese' written in red letters. 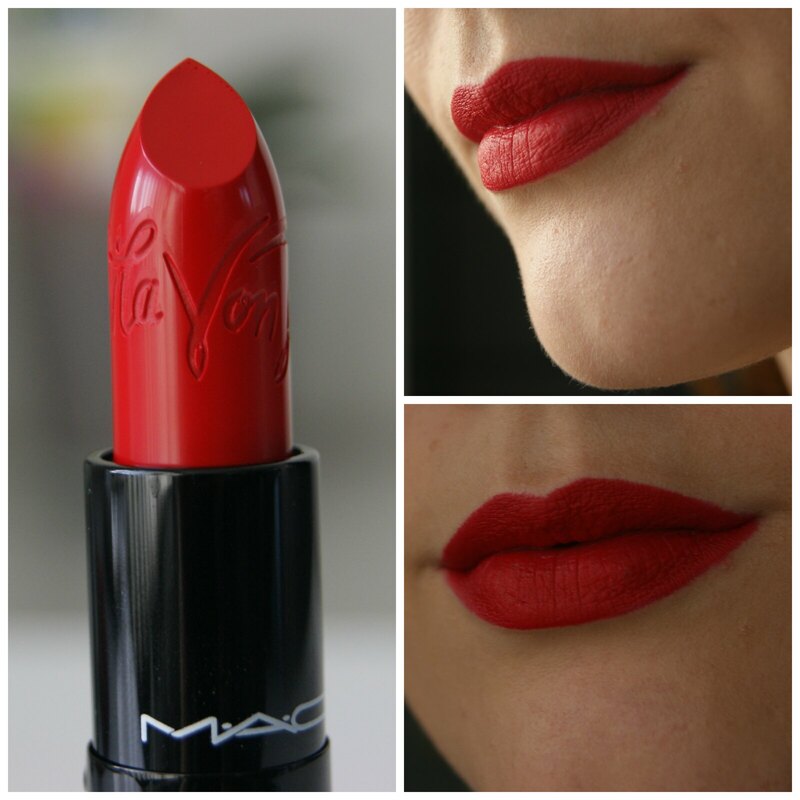 I think it looks chic and it also makes it easier to find it among all your other MAC lipsticks. The outer packaging has Dita Von Teese's campaign picture printed on it. 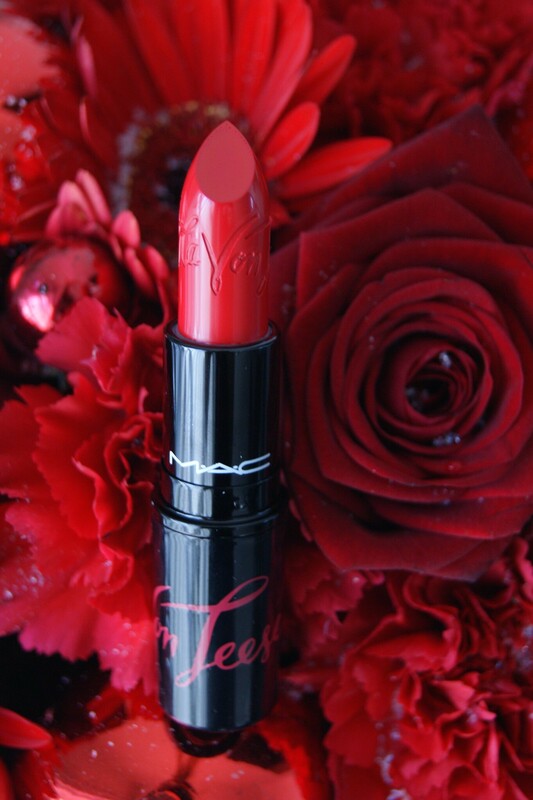 Just like the tube, the lipstick itself also has 'Von Teese' engraved into it. 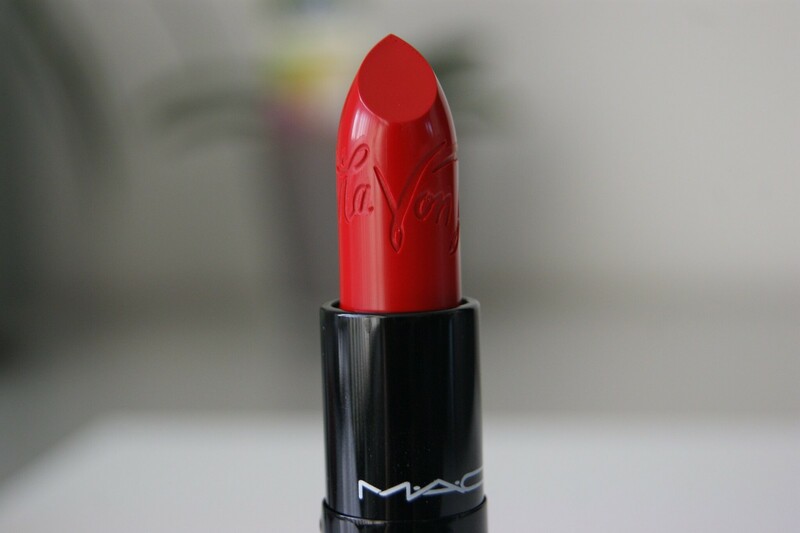 MAC's Von Tease is an intense tomato red; it has a warm, orange undertone and a matte finish. Despite the matte finish, it glides on super easy as where other matte lipsticks might apply a little bit roughly and stiff. It has great pigmentation and gives great coverage. Top Right: Von Tease in direct sunlight. Bottom Right: Von Tease in no direct sunlight. Since I usually wear red lipsticks with a cool undertone, I had to get used to Von Tease at first. But the more I look at it, the more I love it. I would advise you to scrub your lips before applying it, since the matte finish accentuates dry lips. And even though it might accentuate dry lips, it doesn't feel dry on the lips, contrary to many matte lipsticks. The lipstick stays on for hours straight and only needs a little touch up after a meal. 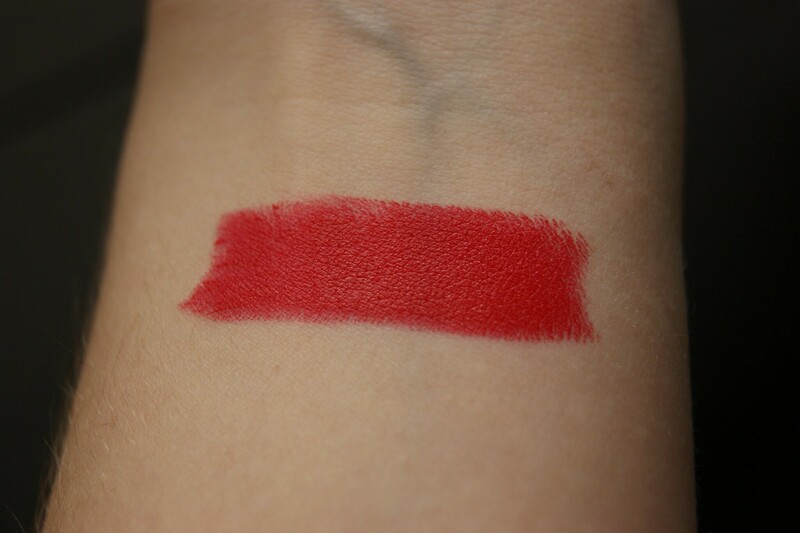 I'm very happy I got my hands on this lipstick -- it's a typical, classic red lipstick that you can't go wrong with. I heard it's still available online here and there, so make sure to check your country's MAC website! 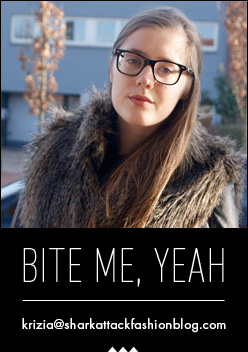 Mooi lippenstift! staat je goed! You should try it ASAP! That lipstick is awesome. Love the colour. Happy NY to you as well! Oh wow, such a pretty colour - no wonder it's sold out!